How to purchase the upgrade to the new version of AnyCount? 2. Click on the 'Product' drop-down list and select your current version of AnyCount (see image 1). 3. 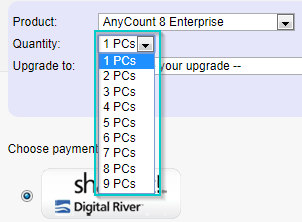 After this step you will be able to select the number of PCs and a final product using the 'Quantity' and 'Upgrade to' dropdown lists (see image 2 and image 3). 4. Choose a desired payment method and click the 'Proceed to checkout' button.